Systems engineering techniques are used in complex projects: spacecraft design, computer chip design, robotics, software integration, and bridge building. Systems engineering uses a host of tools that include modeling & simulation, requirements analysis, and scheduling to manage complexity. 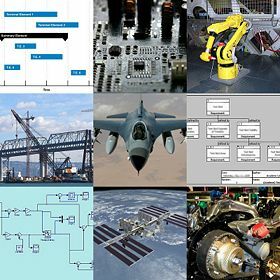 Systems engineering is an interdisciplinary field of engineering that focuses on how complex engineering projects should be designed and managed. Issues such as logistics, the coordination of different teams and automatic control of machinery becomes harder when we deal with large and complex projects, for instance the design and running of the international space station. Systems engineering deals with work-processes and tools to handle this and overlap with both technical fields like control engineering and with project management. QFD House of Quality for Enterprise Product Development Processes. The term systems engineering can be traced back to Bell Telephone Laboratories in the 1940s. The need to identify and manipulate the properties of a system as a whole, which in complex engineering projects may greatly differ from the sum of the parts' properties, motivated the Department of Defense, NASA, and other industries to apply the discipline. When it was no longer possible to rely on design evolution to improve upon a system, and the existing tools were not sufficient to meet growing demands, new methods began to be developed that addressed the complexity directly. The evolution of Systems Engineering as it continues to this day, comprises development and identification of new methods and modeling techniques: Methods that can aid in better comprehension of engineering systems as they grow more complex. Some popular tools often used in the Systems Engineering context such as UML, QFD, IDEF0 were developed during these times. In 1990, a professional society for systems engineering, the National Council on Systems Engineering (NCOSE), was founded by representatives from a number of U.S. corporations and organizations. NCOSE was created to address the need for improvements in systems engineering practices and education. As a result of growing involvement from systems engineers outside of the U.S., the name of the organization was changed to the International Council on Systems Engineering (INCOSE) in 1995. Schools in several countries offer graduate programs in systems engineering, and continuing education options are also available for practicing engineers. "An interdisciplinary approach and means to enable the realization of successful systems"—INCOSE handbook, 2004. "Systems engineering is a robust approach to the design, creation, and operation of systems. In simple terms, the approach consists of identification and quantification of system goals, creation of alternative system design concepts, performance of design trades, selection and implementation of the best design, verification that the design is properly built and integrated, and post-implementation assessment of how well the system meets (or met) the goals. "—NASA Systems engineering handbook, 1995. "The Art and Science of creating effective systems, using whole system, whole life principles" OR "The Art and Science of creating optimal solution systems to complex issues and problems"—Derek Hitchins, Prof. of Systems Engineering, former president of INCOSE (UK), 2007. "The concept from the engineering standpoint is the evolution of the engineering scientist, i.e., the scientific generalist who maintains a broad outlook. The method is that of the team approach. On large-scale-system problems, teams of scientists and engineers, generalists as well as specialists, exert their joint efforts to find a solution and physically realize it… The technique has been variously called the systems approach or the team development method. "—Harry H. Goode & Robert E. Machol, 1957. 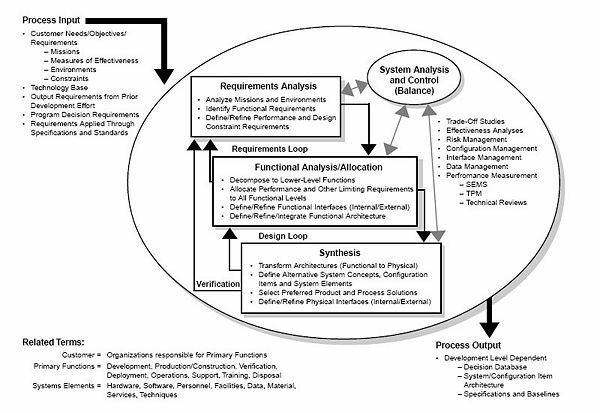 "The Systems Engineering method recognizes each system as an integrated whole even though composed of diverse, specialized structures and subfunctions. It further recognizes that any system has a number of objectives and that the balance between to optimize the overall system functions according to the weighted objectives and to achieve maximum compatibility of its parts. "—Systems Engineering Methods by Harold Chestnut, 1967. Systems Engineering signifies both an approach and, more recently, as a discipline in engineering. The aim of education in Systems Engineering is to simply formalize the approach and in doing so, identify new methods and research opportunities similar to the way it occurs in other fields of engineering. As an approach, Systems Engineering is holistic and interdisciplinary in flavor. Within Oliver's model, the goal of the Management Process is to organize the technical effort in the life cycle, while the Technical Process includes assessing available information, defining effectiveness measures, to create a behavior model, create a structure model, perform trade-off analysis, and create sequential build & test plan. Depending on their application, although there are several models that are used in the industry, all of them aim to identify the relation between the various stages mentioned above and incorporate feedback. Examples of such models are: Waterfall model, and VEE model. System development often requires contribution from diverse technical disciplines. By providing a systems (holistic) view of the development effort, SE helps meld all the technical contributors into a unified team effort, forming a structured development process that proceeds from concept to production to operation and, in some cases, through to termination and disposal. This perspective is often replicated in educational programs in that Systems Engineering courses are taught by faculty from other engineering departments which, in effect, helps create an interdisciplinary environment. The need for systems engineering arose with the increase in complexity of systems and projects. When speaking in this context, complexity is not limited to engineering systems but also to human organizations; at the same time, a system can become more complex not only due to increase in size—as in the International Space Station—but also with increase in the amount of data, variables, or the number of fields that are simultaneously involved in the design. Taking an interdisciplinary approach to engineering systems is inherently complex, since the behavior of and interaction among system components are not always well defined or understood (at least at the outset). Defining and characterizing such systems and subsystems, and the interactions among them, is one of the goals of systems engineering. In doing so, the gap that exists between informal requirements from users, operators, and marketing organizations, and technical specifications that an engineer can implement is successfully bridged. One way to understand the motivation behind systems engineering is to see it as a method, or practice, to identify and improve common rules that exist within a wide variety of systems. Keeping this in mind, the principles of Systems Engineering—holism, emergence, behavior, boundary, and so on—can be applied to any system, complex or otherwise, provided systems thinking is employed at all levels. Besides defense and aerospace, many information and technology based companies, software development firms, and industries in the field of electronics and communications require Systems engineers as part of their team. 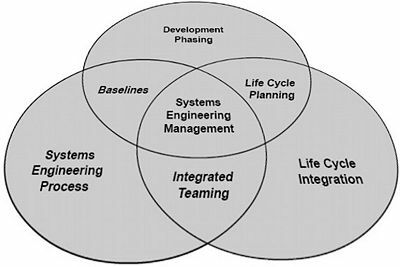 An analysis by the INCOSE Systems Engineering center of excellence (SECOE) indicates that optimal effort spent on Systems Engineering is about 15-20 percent of the total project effort. At the same time, studies have shown that Systems Engineering essentially leads to reduction in costs among other benefits. However, no quantitative survey at a larger scale encompassing a wide variety of industries has been conducted until recently. Such studies are underway to determine the effectiveness and quantify the benefits of Systems engineering. Systems engineering encourages the use of modeling and simulation to validate assumptions or theories on systems and the interactions within them. Use of methods that allow early detection of possible failures, in Safety engineering, are integrated into the design process. At the same time, decisions made at the beginning of a project whose consequences are not clearly understood can have enormous implications later in the life of a system, and it is the task of the modern systems engineer to explore these issues and make critical decisions. There is no method which guarantees that decisions made today will still be valid when a system goes into service years or decades after it is first conceived but there are techniques to support the process of systems engineering. Examples include the use of soft systems methodology, Jay Wright Forrester's System dynamics method and the Unified Modeling Language (UML), each of which are currently being explored, evaluated and developed to support the engineering decision making process. Education in Systems engineering is often seen as an extension to the regular engineering courses, reflecting the industry attitude that engineering students need a foundational background in one of the traditional engineering disciplines (for example, industrial engineering, computer engineering, electrical engineering) plus practical, real-world experience in order to be effective as systems engineers. Undergraduate university programs in systems engineering are rare. INCOSE maintains a continuously updated Directory of Systems Engineering Academic Programs worldwide. As of 2006, there are about 75 institutions in United States that offer 130 undergraduate and graduate programs in Systems engineering. Education in Systems engineering can be taken as SE-centric or Domain-centric. SE-centric programs treat Systems engineering as a separate discipline and all the courses are taught focusing on Systems engineering practice and techniques. Domain-centric programs offer Systems engineering as an option that can be exercised with another major field in engineering. Both these patterns cater to educate the systems engineer who is able to oversee interdisciplinary projects with the depth required of a core-engineer. Systems Engineering tools are strategies, procedures, and techniques that aid in performing systems engineering on a project or product. The purpose of these tools vary from database management, graphical browsing, simulation, and reasoning, to document production, neutral import/export and more. Depending on their application, tools are used for various stages of the systems engineering process. A graphical representation relates the various subsystems or parts of a system through functions, data, or interfaces. Any or each of the above methods are used in an industry based on its requirements. For instance, the N2 chart may be used where interfaces between systems is important. Part of the design phase is to create structural and behavioral models of the system. Once the requirements are understood, it is now the responsibility of a Systems engineer to refine them, and to determine, along with other engineers, the best technology for a job. At this point starting with a trade study, systems engineering encourages the use of weighted choices to determine the best option. A decision matrix, or Pugh method, is one way (QFD is another) to make this choice while considering all criteria that are important. The trade study in turn informs the design which again affects the graphic representations of the system (without changing the requirements). In an SE process, this stage represents the iterative step that is carried out until a feasible solution is found. 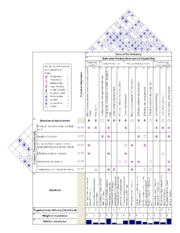 A decision matrix is often populated using techniques such as statistical analysis, reliability analysis, system dynamics (feedback control), and optimization methods. At times a systems engineer must assess the existence of feasible solutions, and rarely will customer inputs arrive at only one. Some customer requirements will produce no feasible solution. Constraints must be traded to find one or more feasible solutions. The customers' wants become the most valuable input to such a trade and cannot be assumed. Those wants/desires may only be discovered by the customer once the customer finds that he has overly constrained the problem. Most commonly, many feasible solutions can be found, and a sufficient set of constraints must be defined to produce an optimal solution. This situation is at times advantageous because one can present an opportunity to improve the design towards one or many ends, such as cost or schedule. Various modeling methods can be used to solve the problem including constraints and a cost function. Systems Modeling Language (SysML), a modeling language used for systems engineering applications, supports the specification, analysis, design, verification and validation of a broad range of complex systems. Many related fields may be considered tightly coupled to systems engineering. These areas have contributed to the development of systems engineering as a distinct entity. Cognitive systems engineering is Systems Engineering with the human integrated as an explicit part of the system. It draws from the direct application of centuries of experience and research in both Cognitive Psychology and Systems Engineering. Cognitive Systems Engineering focuses on how man interacts with the environment and attempts to design systems that explicitly respect how humans think, and works at the intersection of: Problems imposed by the world; needs of agents (human, hardware, and software); and interaction among the various systems and technologies that affect (and/or are affected by) the situation. Sometimes referred to as Human Engineering or Human Factors Engineering, this subject also deals with ergonomics in systems design. Like Systems Engineering, Configuration Management as practiced in the defense and aerospace industry is a broad systems-level practice. The field parallels the taskings of Systems Engineering; where Systems Engineering deals with requirements development, allocation to development items and verification, Configuration Management deals with requirements capture, traceability to the development item, and audit of development item to ensure that it has achieved the desired functionality that Systems Engineering and/or Test and Verification Engineering have proven out through objective testing. Control engineering and its design and implementation of control systems, used extensively in nearly every industry, is a large sub-field of Systems Engineering. The cruise control on an automobile and the guidance system for a ballistic missile are two examples. Control systems theory is an active field of applied mathematics involving the investigation of solution spaces and the development of new methods for the analysis of the control process. Industrial engineering is a branch of engineering that concerns the development, improvement, implementation and evaluation of integrated systems of people, money, knowledge, information, equipment, energy, material and process. Industrial engineering draws upon the principles and methods of engineering analysis and synthesis, as well as mathematical, physical and social sciences together with the principles and methods of engineering analysis and design to specify, predict and evaluate the results to be obtained from such systems. Interface design and its specification are concerned with assuring that the pieces of a system connect and inter-operate with other parts of the system and with external systems as necessary. Interface design also includes assuring that system interfaces be able to accept new features, including mechanical, electrical, and logical interfaces, including reserved wires, plug-space, command codes and bits in communication protocols. This is known as extensibility. Human-Computer Interaction (HCI) or Human-Machine Interface (HMI) is another aspect of interface design, and is a critical aspect of modern Systems Engineering. Systems engineering principles are applied in the design of network protocols for local-area networks and wide-area networks. Operations research supports systems engineering. The tools of operations research are used in systems analysis, decision making, and trade studies. Several schools teach SE courses within the operations research or industrial engineering department, highlighting the role systems engineering plays in complex projects. operations research, briefly, is concerned with the optimization of a process under multiple constraints. Reliability engineering is the discipline of ensuring a system will meet the customer's expectations for reliability throughout its life; i.e. it will not fail more frequently than expected. Reliability engineering applies to all aspects of the system. It is closely associated with maintainability, availability and logistics engineering. Reliability engineering is always a critical component of safety engineering, as in failure modes and effects analysis (FMEA) and hazard fault tree analysis, and of security engineering. Reliability engineering relies heavily on statistics, probability theory and reliability theory for its tools and processes. Performance engineering is the discipline of ensuring a system will meet the customer's expectations for performance throughout its life. Performance is usually defined as the speed with which a certain operation is executed or the capability of executing a number of such operations in the unit of time. It may be degraded where operations queue to be executed whenever the capacity is of the system is limited. For example, the performance of a packed-switched network would be characterized by the end-to-end packet transit delay or the number of packets switched within an hour. The design of performant systems makes use of analytical or simulation modeling, whereas the delivery of performant implementation involves thorough performance testing. Performance engineering relies heavily on statistics, queuing theory and probability theory for its tools and processes. The techniques of safety engineering may be applied by non-specialist engineers in designing complex systems to minimize the probability of safety-critical failures. The "System Safety Engineering" function helps to identify "safety hazards" in emerging designs, and may assist with techniques to "mitigate" the effects of (potentially) hazardous conditions that cannot be designed out of systems. Security engineering can be viewed as an interdisciplinary field that integrates the community of practice for control systems design, reliability, safety and systems engineering. It may involve such sub-specialties as authentication of system users, system targets, and others: people, objects, and processes. From its beginnings Software engineering has helped shape modern Systems Engineering practice. The techniques used in the handling of complexes of large software-intensive systems has had a major effect on the shaping and reshaping of the tools, methods and processes of SE. ↑ J. Schlager, Systems engineering: Key to modern development, IRE Transactions EM-3(1956): 64–66. ↑ Andrew Patrick Sage, Systems Engineering (New York: Wiley IEEE, 1992, ISBN 0471536393). ↑ INCOSE, Genesis of INCOSE. Retrieved September 8, 2008. ↑ 4.0 4.1 INCOSE, Directory of Systems Engineering Academic Programs. Retrieved September 8, 2008. ↑ Systems Engineering Handbook, version 2a (Seattle, WA: INCOSE, 2004). ↑ Robert Shishko, Robert Aster, R.C. Cassingham, and United States National Aeronautics and Space Administration, et al., NASA Systems Engineering Handbook (Washington, DC: National Aeronautics and Space Administration, 1995). ↑ INCOSE UK, Derek Hitchins. Retrieved September 8, 2008. ↑ Harry H. Goode and Robert E. Machol, System Engineering: An Introduction to the Design of Large-Scale Systems (New York: McGraw-Hill, 1957), page 8. ↑ Harold Chestnut, Systems Engineering Methods (Hoboken, NJ: Wiley, 1967, ISBN 0471154482). ↑ David W. Oliver, Timothy P. Kelliher, and James G. Keegan, Jr., Engineering Complex Systems with Models and Objects (New York: McGraw-Hill, 1997, ISBN 0070481881), pages 85-94. ↑ George Mason University, The SE VEE. Retrieved September 8, 2008. ↑ Simon Ramo and Robin K. St.Clair, The Systems Approach: Fresh Solutions to Complex Problems Through Combining Science and Practical Common Sense (Anaheim, CA: KNI, Inc., 1998). Retrieved September 8, 2008. ↑ Cornell University, Systems Engineering Program at Cornell University. Retrieved September 8, 2008. ↑ MIT, ESD Faculty and Teaching Staff, Engineering Systems Division. Retrieved September 8, 2008. ↑ Cornell University, Core Courses, Systems Analysis—Architecture, Behavior and Optimization. Retrieved September 8, 2008. ↑ Rick Adcock, Principles and Practices of Systems Engineering, INCOSE, UK. Retrieved September 9, 2008. ↑ George Mason University, Systems Engineering, Career Opportunities and Salary Information (1994). Retrieved September 9, 2008. ↑ 18.0 18.1 INCOSE, Understanding the Value of Systems Engineering. Retrieved September 9, 2008. ↑ Ricardo Valerdi, Christopher Miller, and Gary Thomas, Systems Engineering Cost Estimation by Consensus. Retrieved September 9, 2008. ↑ Andrew P. Sage and Stephen R. Olson, Modeling and Simulation in Systems Engineering, Simulation 76(2): 90-91. Retrieved September 9, 2008. ↑ Gerrit Muller, Didactic Recommendations for Education in Systems Engineering. Retrieved September 9, 2008. ↑ INCOSE, Perspectives of Systems Engineering Accreditation. Retrieved September 9, 2008. ↑ Steven Jenkins, A Future for Systems Engineering Tools, NASA. Retrieved September 9, 2008. ↑ Jim Long, Relationships between Common Graphical Representations in System Engineering, Vitech Corporation. Retrieved September 9, 2008. ↑ SysML Open Source Specification Project, OMG SysML Specification. Retrieved September 9, 2008. Chestnut, Harold. 1967. Systems Engineering Methods. New York: Wiley. Goode, Harry H., and Robert E. Machol. 1957. System Engineering: An Introduction to the Design of Large-scale Systems. New York: McGraw-Hill. Oliver, David W., Timothy P. Kelliher and James G. Keegan, Jr. 1997. Engineering Complex Systems with Models and Objects. New York. McGraw-Hill. ISBN 0070481881. Ramo, Simon and Robin K. St.Clair. 1998. The Systems Approach: Fresh Solutions to Complex Problems Through Combining Science and Practical Common Sense. Anaheim, CA: KNI, Inc.
Sage, Andrew P. 1992. Systems Engineering. New York: Wiley IEEE. ISBN 9780471536390. Sage, Andrew P., and Stephen R. Olson. 2001. Modeling and Simulation in Systems Engineering. Simulation. 76:2:90-91. The International Council on Systems Engineering (INCOSE) homepage. Shishko, Robert et al. NASA Systems Engineering Handbook. NASA Center for AeroSpace Information, 1995. This page was last modified on 10 November 2015, at 17:19.